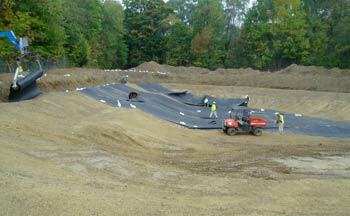 The firm designed a passive wetland system as a long-term solution to treat 280,000 gallons per day of contaminated groundwater in Wellsville, N.Y. As part of that project, the crew places an impermeable liner in the wetland basin. The system consists of a cascade aerator, sedimentation pond, parallel surface flow wetlands, parallel vertical flow limestone drains, and sand drying beds for iron precipitate dewatering. Exploiting the biological complexity of natural systems to cope with the complexity of industrial waste streams is becoming a more attractive option because engineered treatment wetlands typically are mechanically simple and have low operation and maintenance costs. While many industrial companies spend a great deal of money treating wastewater to comply with environmental regulations, they are now also considering the additional benefits and perceived value of treating industrial wastewater using engineered wetlands. When integrated with nature centers, trail networks, and natural habitats, industrial treatment wetlands become valued as responsible solutions that are environmental showcases for a company. Making natural wetlands work in industrial applications depends on disciplined engineering practices. Taking away the geometric uncertainty is first, closely followed by installation of impermeable liners, and specific placement of influent and effluent points. With the additional control of water level, the systems begin to behave more like an engineered reactor. A wetland cell can be rigorously engineered to be a stand-alone treatment process, or it can be coupled with other processes, such as lagoons, to augment performance. Loading rates are controlled to exploit bacterial growth. Wetland cells are filled with gravel media, which is cleaned and sized to optimize hydraulics and treatment. A blower supplying bed aeration is installed, which allows the engineer the freedom to control location and size of aerobic zones. Flow within the wetland is recirculated to optimize treatment. Mulch is used for insulation. Eventually, what seemed to be a passive, uncontrollable technology begins to have a process schematic similar to advanced sewage plants. Given such freedom of control, engineered wetlands can be "tailored" to live with and treat a wide spectrum of pollutants. Engineered wetlands can serve several industries in various applications with high quality treatment and remediation -- including airport deicing fluid, feed lot, leachate, and petroleum remediation. For a groundwater remediation site, a wetland was designed with nature trails and an observation deck. In another case, a wetland was created at a concentrated feedlot to create wildlife habitat. In each case, the company and the community appreciated the value of the wetland as a treatment system and natural asset. ARCO Refinery Site, Wellsville, N.Y. The former refinery site operated by Sinclair Oil Co., is now home to The State University of New York's Wellsville campus. As a result of the refinery's practices, groundwater is contaminated with hydrocarbons, metals, and chlorinated solvents. This land is adjacent to the Genesee River, which continuously receives the contaminated water. Atlantic Richfield Co. (ARCO), the current property owner, realized that it needed a treatment system that would operate for at least 100 years with minimal maintenance requirements. ARCO also wanted a treatment system that would benefit and blend in with the Wellsville community. A passive wetland system was designed as a long-term solution to treat 280,000 gallons per day of contaminated groundwater. The system consists of a cascade aerator, sedimentation pond, parallel surface flow wetlands, parallel vertical flow limestone drains, and sand drying beds for iron precipitate dewatering. The design also incorporates an upgrade of the adjacent rails to trails path, restoration of the adjacent river swale, and a 20-acre site plan using entirely native plants including trees, shrubs, wildflowers, grasses, and wetland plants. The site plan also incorporates a trail system with elevated boardwalks through the wetlands. This engineered wetland system provides an ecologically based, low-maintenance, long-term solution to treat the groundwater contamination in Wellsville. The system requires minimal energy and will become part of the landscape as it matures, turning a challenging problem into a community amenity. JW NAWE’s patented Forced Bed AerationTM system is designed to treat the strong and variable waste streams from Buffalo Airport's deicing operation. At full buildout, the wetland will consist of eight cells excavated from an existing open area near the airport's main runway and will encompass roughly 10 acres. The system is currently under construction. 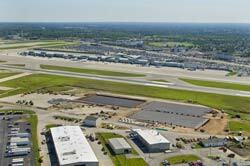 Buffalo Niagara International Airport, N.Y.
Another innovative use of engineered wetlands is the use of subsurface, aerated gravel beds to treat stormwater contaminated with glycol from airport deicing operations. These wetlands are in the design stage for Buffalo Niagara International Airport (BNIA). The below-grade beds are designed to sustain a resident, attached community of bacteria acclimated for the specific task of glycol removal. The stormwater is distributed uniformly over the beds and flows vertically through the gravel to a system of underdrains. Air is pumped to the beds through a network of aerating tubing. The bed is insulated on top with a layer of peat mulch to conserve heat. Key to executing the design was the successful off-site treatability testing of propylene glycol-spiked stormwater from the airport. Pilot work at wetland test facilities was conducted to evaluate the performance of the system and to determine process kinetics. The results of the pilot-scale testing determined that there was 96-97 percent removal of target pollutants at both the high- and low-design basis temperatures. At full buildout, the wetland will consist of eight cells excavated from an existing open area near the airport's main runway and will encompass roughly 10 acres. At ground level, only a field of wetland grasses will be observable, growing from a "dry" mulch surface. An important factor of the design is the size of the gravel used and the porosity of the bed. Detailed analysis of biomass growth, storage, and decay was performed to ensure that the bed could accommodate the transient nature of the bacterial community. Environmental managers and engineers are looking for treatment solutions that work for the long haul. Designing systems to handle future flows with lower life cycle costs is a goal in most cases. Engineered wetlands deliver on this goal and integrate the treatment necessity into the facility often enhancing the site for plants, animals, and people.